Todolwen: Practice Makes Perfect ..
practice makes perfect or so they say and I hope that will be so in my case because right about now it isn't happening for me. ... and was taken by the beauty of the embroidered blossom. 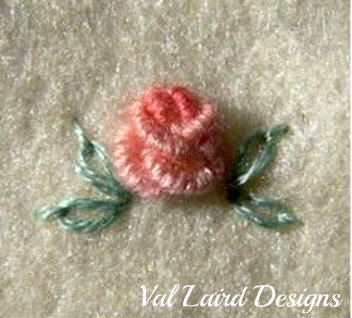 And now I so want to learn how to embroider Bullion roses too. They are just beautiful and can turn a plain piece of fabric into something just so lovely. ... gathered everything I need to start so I began. Unfortunately as easy as it might look, it wasn't that easy for me. I tried and tried and almost every time something went wrong but I will not give up yet but try, try again until I have done it right even if it will take me weeks to master them but that also means that it might take me some time before I will be able to share anything that has to do with them. But it will happen because I am determent to learn how to make this lovely little blossom. So do stop by from time to time and visit me here again at Todolwen and see what I have been up too. With your patience and stick-with-it-ness you'll become very adept at it in no time at all. They really are very nice little pretties. Go for it girl!!!!! I can't seem to master this one either - I can do the bullion stitch itself but turning it into something that resembles a flower has been a complete lesson in frustration. You will make it Karen! I know that, because of the wonderful christmas gift you made for me. Good luck, I'm sure in time you'll master it. 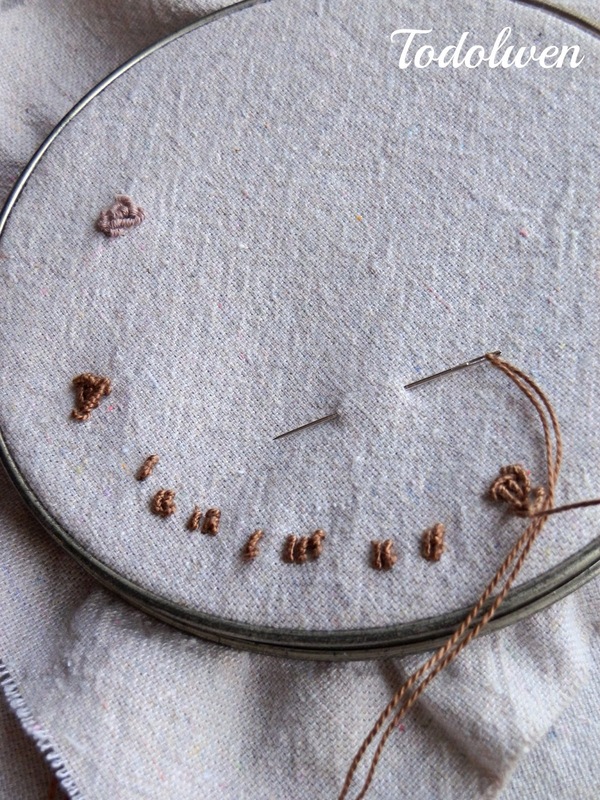 Sometimes those easy looking stitches turn out to be the hardest. I've never been very good at needle crafts (thus the reason my mother didn't even try to teach me crochet), so I doubt I'll ever try this myself. That little flower at the top of your post is quite precious. You will get this. It takes time and practice to learn new stitches, I am still learning. Best wishes as you try to make a beautiful little blossom. You can do it! I made this embrodery roses on my teddybears. My mother teached me how to do this . It's not hard to make them, all you have to do is trying. You can do it!!! Bullion stitch has always defeated me, grrrr. It is soooo difficult! Kudos to you for not giving up, looks like you are well on the way to cracking it. Hi Karen. 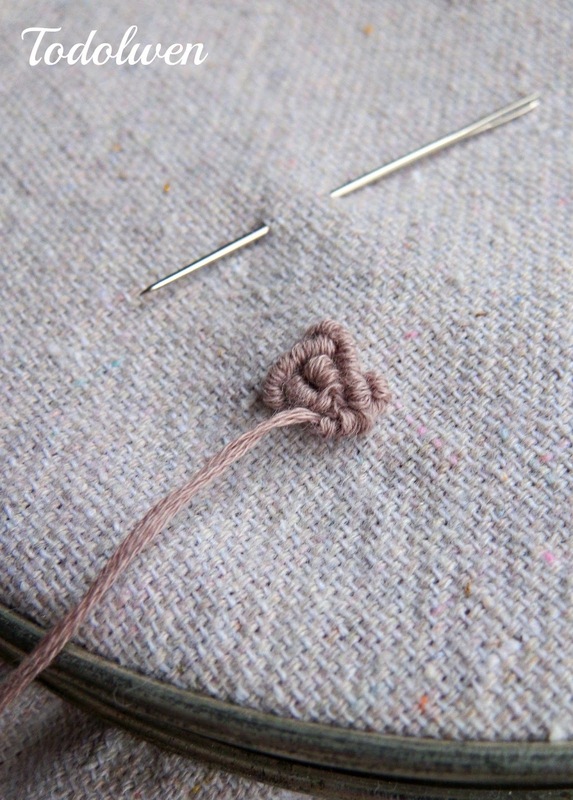 I found that the tutorial on Needlenthread was very good. Practice does help. 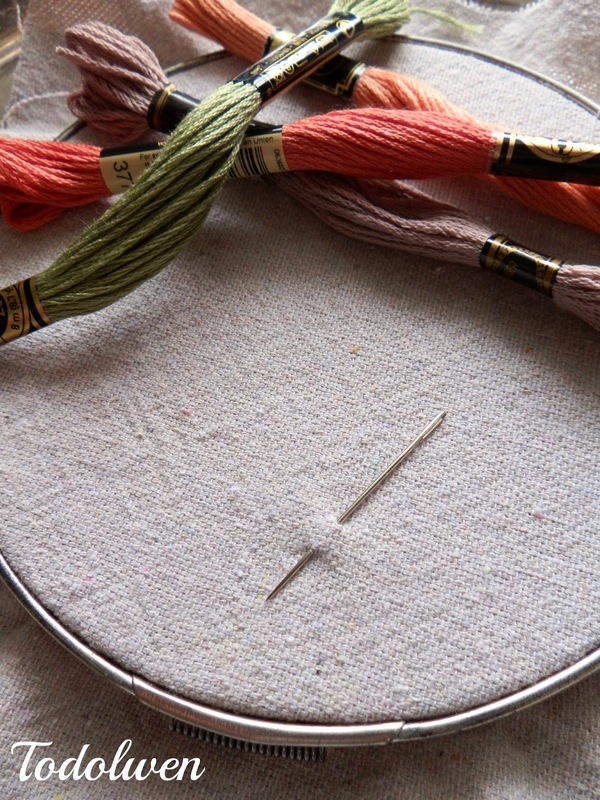 I learned, too, that you can move the stitches on the needle with the thumb and finger of the left hand to either tighten (clockwise) or loosen (counterclockwise) the wrap. Pulling the needle horizontally ( instead of up towards the ceiling) once it's wrapped helps, too. I like to use 2-ply embroidery floss. Hope you have fun.